Increase efficiency and improve workspace safety when you choose the patented, splash-reducing WaveBrake wet mopping system. Down-press jaw-action wringer presses out more water with less effort than side-press alternatives. Ergonomic wringer handle reduces wrist stress. Convenient snap-in, snap-out dirty-water bucket helps keep clean water clean. 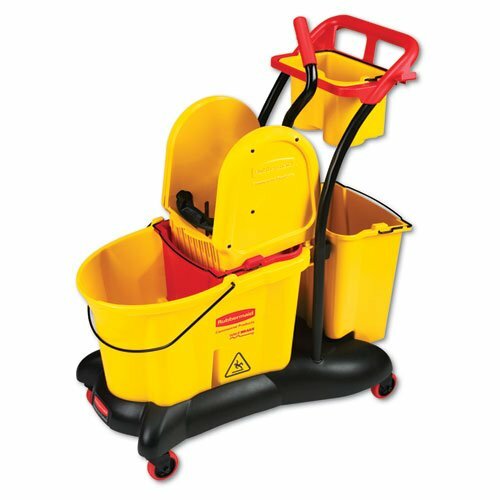 Producing nearly a tenth of the noise of average mop buckets, the Quiet-Caster trolley allows you to inconspicuously transport everything you need. Removable maid caddy keeps towels and cleaning solutions close-at-hand. Capacity Range (Volume): 8.75 gal; Depth: 18 1/5"; Width: 28 9/10"; Height: 38 3/5". Highly efficient down-press jaw-action wringer.